‘Pitch Perfect 3’ aca-awesome? To some. When I go to the movies, I do so because I want to be entertained, but this can come in a variety of forms. Entertaining me doesn’t mean that you have to put an Oscar-worthy performance on the screen. Often, it can be something others might find cringe-worthy, cheesy or just plain goofy and yet I find myself laughing all the way through it. Take Rat Race, for example. This comedy, which came out in 2001 and starred Whoopi Goldberg, Rowan Atkinson, Seth Green and others, is about six teams who are on a mad dash across the country to find a locker with two million dollars in it. No Academy Award performances here and while it opened to mix reviews, it genuinely made me laugh until my stomach hurt. It came out at a time that I needed a good laugh and this movie’s slapstick comedy and many sight gags delivered, for me anyway. Of course, there’s entertainment on a completely different level, with screenwriting and cinematography that is award-worthy. Hidden Figures delivered a powerful script that kept you intrigued throughout the entire movie and had top-notch acting performances. Then there are movies like Avatar, which was stunningly beautiful and worth a ticket to see it on the big screen. When it comes to the highly-anticipated final movie in the Pitch Perfect trilogy, I enjoyed it, but keep in mind there’s not one of the three movies where I walked in to the theater expecting to see an Oscar-worthy performance. Movies about singing and dancing competitions engage me. The first Pitch Perfect movie, which premiered in 2012 and starred Anna Kendrick, Rebel Wilson, Brittany Snow, Adam DeVine and Ben Platt, among others, is undoubtedly the best of the trilogy. The movie follows the Barden University's all-girl a cappella group, The Barden Bellas, as they compete, but there’s another storyline underneath with Kendrick’s Beca Mitchell. Beca joins the Bellas because her controlling father said that if she did one thing for the year and didn’t like it, he would then be behind her desire to go to California and pursue her musical dreams. Of course, Beca ends up enjoying being in the Bellas and comes out from her typically introverted self. I could do without the vomit scene – any vomit scene actually – and found the movie endearing. I was hooked. It’s no surprise here then that I’ve enjoyed Pitch Perfect 2 and Pitch Perfect 3. I didn’t go into the theater expecting anything other than Bella fun and that’s exactly what I got. Granted, Rebel Wilson’s storyline with Fat Amy was what I would classify as “cheesy” but it was cheesy fun and closed out the trilogy with excitement and tears. I’ll miss the Bellas. Katusha Jin said that the third installment of the a capella franchise may not be as groundbreaking as the first movie, but it definitely holds true to its style. “Even though everything unravels in a predictable way, it is still very entertaining to watch,” she said. “Maintaining its feel-good nature throughout, the audience is left positive and satisfied with the characters and their individual journeys. Although the dialogue is, at times, cringe worthy, writers Kay Cannon and Mike White manage to keep it consistent in style. Rebel Wilson’s one-liners are very recognizable and will definitely make for a good laugh with friends. More than anything, Trish Sie’s movie is for those who enjoy singing along to familiar songs and appreciate cheeky jokes. It is a sweet way to (end?) their “aca-journey”. Not everyone agreed with how much I liked it, however. Georgi Presecky said that Pitch Perfect 3 is proof that you can have too much of a good thing. Brigid Presecky calls Pitch Perfect 3 the weakest of the "trilogy" that didn't need to be a trilogy in the first place. 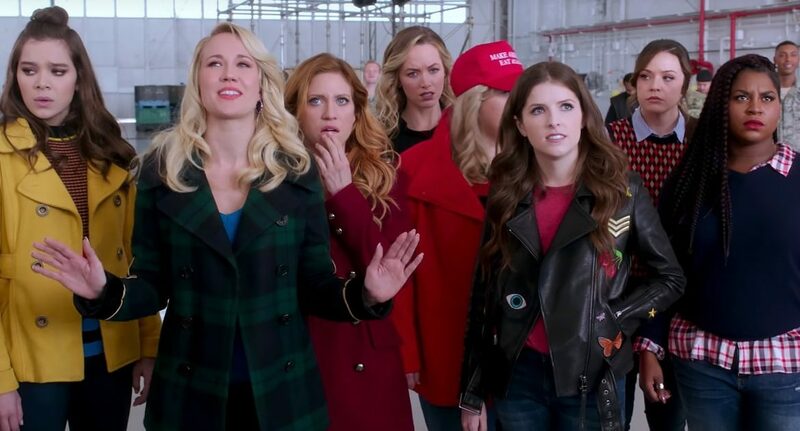 “Aside from an endearing last number, watching Brittany Snow, Anna Kendrick and co. tear up at their final performance as the Bellas, it was a cringe-worthy plot that left a sweet, original story tarnished with franchised residue,” she said.